The feud between the Shannon family and the Harkey clan continues. Chace and Cassie Shannon head to New Orleans to put the bloodshed behind them. But the Harkeys have other ideas, and bring along a pack of bloodhounds trained to kill to track the twins down. Brought to bay hundreds of miles from their kin, Chace and Cassie must rely on their wits and each other if they’re to survive the vicious hounds of hate. Way back in October 2010 Signet published a book by David Robbins called Blood Feud, this story introduced us to Chace and Cassie Shannon and told of their blood feud with the Harkey clan. Although this was a great stand-alone novel it did leave the way open for a sequel and that has finally happened with the publication of Hounds of Hate. The story begins where the previous book finished with Chace and Cassie and their followers heading into New Orleans. Chace has a plan but keeps everyone in the dark about it, something I’m going to do too so as not to spoil this aspect of the tale. The book contains plenty of action that often comes without warning and in one case proving how cold and vicious Chace can be. Dialogue is believable and often had me laughing out loud, as did some of the antics of Tallulah, a young girl who is one of the Shannon gang, with her dreams of marrying Chace someday, making her fiercely protective of him, much to the astonishment of others and Chace in particular. David Robbins switches from character to character regularly and often leaves them in peril at a chapter end encouraging you to keep reading. The story flows smoothly towards its final showdown between Chase, Cassie and the Harkey’s that have trailed them to New Orleans, the hounds giving a viciously deadly twist to this last gunfight. Everything concludes neatly and satisfactorily but, like before, the story does leave the way open for another book. Let’s hope David Robbins doesn’t keep us waiting quite so long to find out what happens next. Griffin Boone is happy in his Wyoming valley; he has his Arrowhead ranch, his close friends, a good stock of cattle and a job as a part time deputy sheriff in the county of Liberty. Boone has ridden through the battlefields of the Civil War, served throughout with John Bell Hood’s Texas Brigade, he has survived the horror of battle and found peace and solitude with a woman and a shared past. That long-ago trail they once unknowingly rode draws them ever closer together until their lives are threatened by Heck Thomas and his outlaw crew of gunfighters and vagabond thieves. Ride with Boone from the peaceful town of Liberty to the ruins of Glory, a ghost town in the foothills of the Big Horn Mountains where past meets present in a blaze of gunfire. Griffin Boone is a quiet, unassuming man, a gentleman – but make no mistake, you cross him at your peril…. 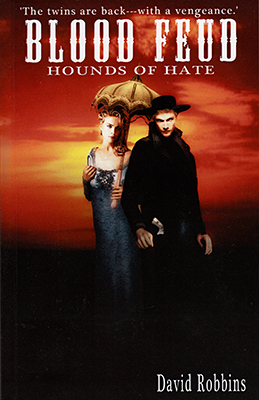 Harry Jay Thorn takes the unusual approach of writing this story in both the first and third person point of view. Thorn blends the two types of storytelling so smoothly I hardly noticed the switch from one to the other. 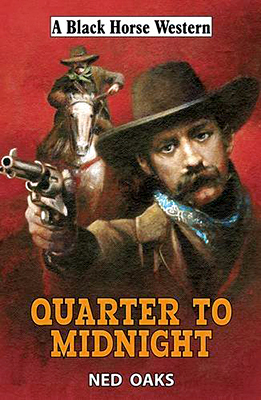 Most of the characters are likeable in some way, and that includes Thomas’ outlaw band – I did say most as it’s one of them, Huck Flynn who is the odd one out and it will be him who causes all the problems, including a falling-out among the outlaws that will see Boone determined to bring them to justice. The book contains plenty of fast, bloody action and a few surprises too, including one at the end of the final showdown. 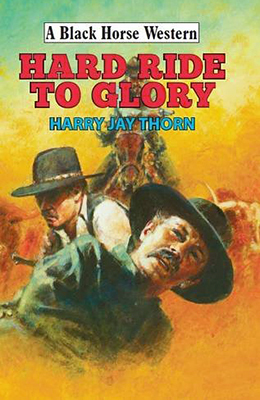 Harry Jay Smith is one of a number of pseudonyms Chris Adam Smith uses, alongside his real name, for writing his Black Horse Westerns and my collection contains quite of few of them. On the strength of this book I think it’s time I dug out some more of his work. Black Horse Westerns are now available as both hardbacks and ebooks. Steve Karner was attacked one night in the woods outside Stayton, Oregon. Beaten nearly to death and thrown in the river, he hadn’t been seen in years, and everyone assumed he was dead. But then the men who tried to kill him started dying, one by one, and it soon became apparent that Karner was not only alive, but riding a vengeance trail that wouldn’t end until he had found the mastermind behind the attempted murder. There are many dangers to be faced along the way, however – a tough town marshal who wants the truth, a cunning young millionaire who will use all his family’s power to protect his secrets, and a cold-blooded hired killer who’s been paid a very tidy sum to kill Steve Karner. It all comes together in a brutal final showdown in which the truth is revealed…and only one man is left standing. This is Ned Oaks second Black Horse Western and the first I’ve read. Filled with well thought out characters the motives that drive them had me hooked immediately as did the desire to discover just why Karner had been attacked. Karner’s vengeance on those who beat him and threw him in the river is dealt with fairly quickly making the reader wonder where the rest of the story will go. With Karner in jail and a killer closing in the already fast pace of the story shifts up a gear and the book becomes very difficult to put down. Tension, more deaths, swift gun action, and a great twist leading to a final confrontation brings the book to an exciting ending. On finishing this story I found myself wishing I’d read Ned Oaks’ previous book, The Drygulch Trail, but finding a copy of that can wait as I already have his third book, Rimrock Renegade, that has been published by Crowood this month and I will certainly be reading that as soon as I can. If you’d like to find out more about Ned Oaks you can read an interview with him here. In case you missed it, Black Horse Westerns are now available as ebooks as well as hardbacks. This is the first book I’ve read in this series and it’s the first written by John Hegenberger. 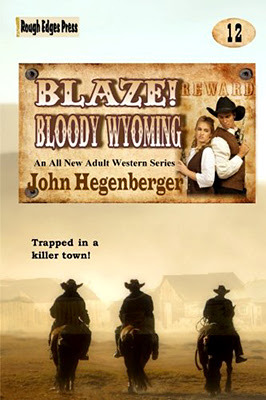 Blaze was launched to fill the gap left by the now finished Longarm, Slocum and The Trailsman series, and like them is written by a variety of authors, but here the writers name is on the cover rather than hidden behind a pseudonym. Like those three much missed series the Blaze books have adult content as the cover states. Not having read any of the previous books I don’t know how well John Hegenberger has captured the characters of J.D. Blaze and Kate. Kate isn’t in this one that much, it’s more about J.D. and his attempts to free her from her captors. J.D. also allows his temper to drive his actions which will see him follow false leads and get into numerous deadly scrapes. Adult westerns often offer the reader well thought out, entertaining action-packed reads and this book certainly falls into that category. The sexual content sandwiches the main story and can easily be skipped if you don’t really go for that part of this kind of story without spoiling the rest of the yarn. On the strength of this tale I think it’s time I caught up on the previous books. I’m not sure why I haven’t already done so as there are some great authors working on this series which looks set to run until at least the end of 2017 with book 13: Night Riders by Michael Newton being released at the beginning on September. Available as both print and ebook.